Our units are well decorated and very clean. The all have new front loader washer/ dryers and refrigerators. There is a beautiful lake view water show light synced to music every night from the balcony. Enjoy the relaxing tropical breezes and view gorgeous sunrises from the balcony of this beautiful luxury condo at Laketown Wharf Resort. This condo is beautifully decorated. The kitchen has granite counter tops, appliances, fully equipped kitchen including coffee pot, blender and toaster. The dining area has a table for 4 + seating for three at the counter. The connecting living area is has a SLEEPER sofa, large 50' flat screen TV, DVD player and a stunning view of the Lake. The master suite has a modern queen size bed, private master bathroom with bed and bath linens, flat screen TV and entry to the furnished, private balcony. we have a second bedroom with queen bed and attached bath. The guest room is accommodated with a bunk bed with the bottom bunk being a full size bed and the top bunk a twin bed. There is also a single twin bed in the room as well. There is also a flat screen TV in this room as well. Additional sleeping accommodations is in an large nook area with a triple bunk bed system. The bottom bunk pulls out as a trundle bed. This area has its own built in cabinetry as well. The sofa is also a sleeper as well. We have keyless door entry for easy check in. We will send you the door code about a week before you arrive since we change our door codes on a regular basis. The private, furnished balcony is another asset that makes this Laketown unit unique and a great accommodation. From the comfort of this balcony, you can enjoy the nightly light-and-water shows. Laketown Wharf Resort has the areas most comprehensive set of on-property amenities. Five large pools include one zero-entry pool on the ground level, a 10th floor rooftop pool that overlooks the Gulf of Mexico, a large kiddie only pool, and a large pool in the middle of a private lake. Laketown Wharf also has a 52,000 sq. ft. of lakefront boardwalk, fully equipped fitness center, covered parking, children's playground and the beautiful, sugar white sandy beaches with emerald green waters of the Gulf for which the area is most known. Since Laketown Wharf is located in the east end, which some say the heart, of Panama City Beach, our guest experience the ultimate vacation! Everything you can imagine is just a walk away or within minutes. Resturants, shopping and local tourist and local attractions are just a short walk way. While Frank Brown Park (home to Grand Slam Tournaments) and Pier Park's shopping/dining/entertainment venue are just a few short minutes. Laketown Wharf is ideally located in the heart of everything that is known to Panama City Beach. Your stay at Laketown Wharf will leave you with a lasting impression and memories for a lifetime! * Ripley's Believe It or not! * Wonder Works and much, much more!! No Smoking, No Pets. Primary renter must be at least 18 years of age. We want all of our guests to have a great relaxing vacation. Please remember this is a privately owned vacation condo whose owner and this is our vacation home as well. Please take care of it as you would your own home. You can EMAIL or TEXT for rental inquiries or if u have questions before or after check in. I will have a member of my staff come by the condo to pick up the rental fees. This was a very clean, nicely furnished condo. We had everything we needed and there was plenty of room. The view of the lake and light show was very nice and that was from the balcony. The view from the front door of the ocean is also very nice. Will definately stay again. 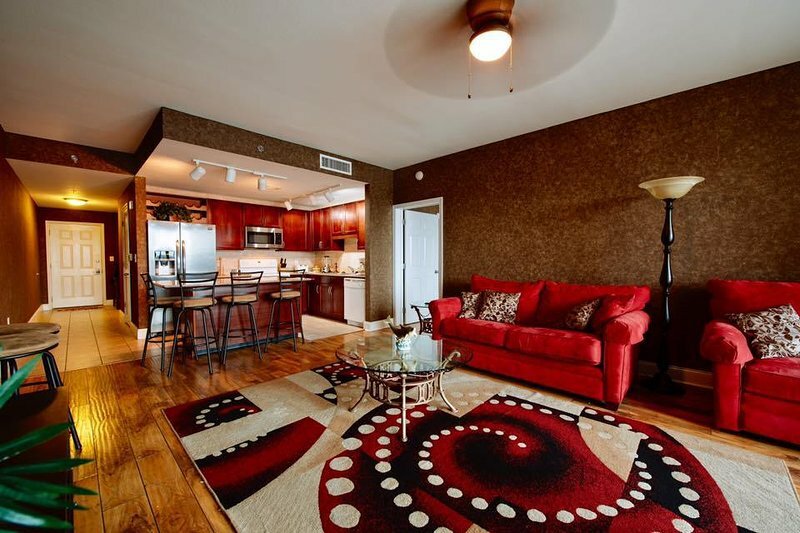 We had the most amazing time, weather and all around vacation in condo 328 at Laketown Wharf! The grandbabies had the time of their lives. The only thing missing was an ice cream scoop (not really a problem, Lol), we had everything we needed for a fabulous 7 day vacation. Will definitely stay here again! This condo was perfect for my 5 night stay. It was very clean, up to date, not run down. The pools were never crowded. Perfect view of the lake to watch the light show from the balcony. Definitely will stay again! We stayed at the Majestic Towers unit 1203. Overall from arrival to departure, it was an amazing experience. The condo was beautiful, clean and completely stocked with everything we ever needed. The facilities from the reserved beach chairs and umbrella to the multiple pools was great. Definitely made oureservations family trip one to remember. Would definitely stay here again. We stayed here for the week and had such a great time! The owners were so kind and helpful.... Can't wait to go back! Absolutely love this place. Had an amazing time and the place is super nice and clean. Only complaint is the slow elevators. The condo is very well looked after, it's spacious, it has an amazing view, the people there are very friendly and the condos are outstanding. Great setup and so convenient! Our kids had a great time and wanted to spend more time at the pools than the beach. Within walking distance of everything you need. Great view of both the lakeside light show and the beach. Would definitely rent again. Owner's reply: Thank you for being such a great guest! We look forward to having you stay with us again. Thank you! The condo was absolutely beautiful. Tastefully decorated and very spacious. The reservation process was extremely easy and Kelly was super nice. She was quick in her responses and guided me through the entire process. The condo was central to everything and the resort was a plus two. With the many different pool options, friendly staff and the option of the beach being just a few feet away, it's def the place to be in Panama City Beach. I can't wait to take a trip up there again and Will definitely be staying in the same condo if available. WE enjoyed our stay at this condo in Laketown Wharf. Condo was very spacious and clean. There was enough room for everyone in our party. Balcony was large enough to accommodate all of us. Had fun swimming in the different pools and being able to walk to so many places. Owner's reply: Tara, Thank you for choosing our condo for your PCB vacation. I am so happy to hear that you guys enjoyed your stay at laketown wharf resort. We look forward to having you as our guest again for your next PCB vacation!